(NewsUSA) - If you enjoy relaxing and entertaining on your porch or patio, you are not alone. Today's homeowners love being outdoors, and design professionals are being tasked with creating extravagant outdoor living areas with all the creature comforts that are typically found indoors - a task they're accomplishing with natural building materials such as cypress. Mark Tuck of the Southern Cypress Manufacturers Association, www.CypressInfo.org, says, "Cypress is a beautiful wood that looks exotic. More importantly, it is a durable wood that - when properly installed and maintained - provides long-lasting performance. It's perfect for outdoor use!" Unlike other species that need to be pressure-treated with chemicals for outdoor use, cypress comes by its durability naturally. When growing, cypress trees produce cypressene in their heartwood. This preservative oil protects the wood from the elements, and it repels insects such as termites and carpenter bees that often feed on and nest in other species. "Thanks to its natural characteristics," Tuck adds, "cypress has typically been used as siding or as an outdoor ceiling product. But more recently, design professionals are using it for a variety of other outdoor applications." "Outdoor rooms, peaceful spaces, and low-maintenance materials are the buzzwords I hear most from my clients," says Nancy Moore of The Porch Company in Nashville, Tennessee. "I like to use cypress in spaces that are exposed to the elements. From my experience, it holds up well to blowing rain that may come in. I love its character, authenticity, longevity, and the fact that it is a renewable resource." Moore says that her clients prefer porch designs that flow from the inside to the outside, which includes the flooring. "We typically use tongue-and-groove cypress for our porch floors because it makes the space feel like another room of the house - a room that just happens to have walls that breathe." The heart of the home has long been the kitchen, right? So as today's homeowners spend more time outside, creating a secondary kitchen outdoors is a top priority. When crafting cabinetry for outdoor kitchens, Rod Richardson of Associated Construction Group, Gonzales, Louisiana, relies on cypress, and for good reasons. "It offers value, appearance, and performance that lasts," Richardson says. "In my 20 years of building outdoor kitchens with cypress, I haven't had a callback. "There are many building materials available, but one has stood the test of time and that's wood. It offers an appearance, feel, and even smell that you can't re-create with man-made products. And when I show customers different cabinet materials - even different woods - they usually lean towards cypress." 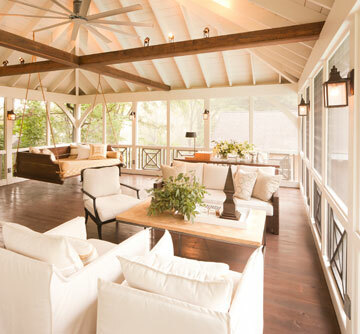 Incorporate cypress into your lavish outdoor space. See how at www.CypressInfo.org. For outdoor spaces, cypress floors offer good looks, comfort underfoot, and long-lasting performance, as in this lavish space built by The Porch Company and captured by J. Paul Moore Photography.